Washington – Three astronauts successfully descended to Kazakhstan on Friday in their Soyuz TMA-17 capsule after spending 141 days in space. 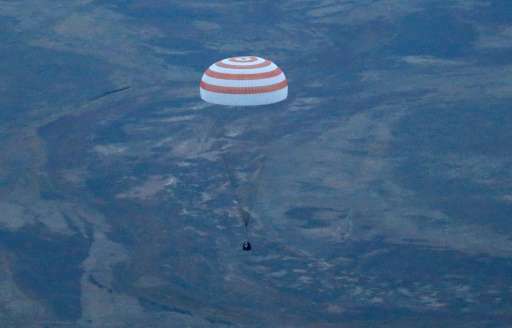 Three members from the International Space Station, NASA’s Kjell Lindgren, Russia’s Oleg Kononenko of Roscosmos (Russian Federal Space Agency) and Kimiya Yui of the Japan Aerospace Exploration Agency (JAXA) returned to Earth on Friday in the town of Dzhezkazgan in Kazakhstan. They landed in their Soyuz TMA-17M capsule on parachute before landing softly in darkness in the wind-swept snowy steppes. The trio arrived at the station July 23 and orbited Earth 2,256 times, traveling a total of 59.6 million miles. It was Lindgren and Yui’s first mission and the third for Kononenko, who has now spent 533 days in space total. While in space, the crew participated in Earth observations and conducted research in the areas of physical, biological and molecular science to improve knowledge and demonstrate new technologies. Such investigations enable research breakthroughs and conduct technology innovations that would provide benefits on Earth, and will enable long-term human and robotic exploration missions into deep space. The ISS space laboratory has been orbiting the Earth at roughly 28,000 kilometres per hour since 1998. Space travel has been one of the few areas of international cooperation between Russia and the West that has not been wrecked by the Ukraine crisis or other international disputes. However, the space program has still faced obstacles this year. Russia stopped all space travel for almost three months after the failure of the unmanned Progress freighter in late April. The ship lost contact with Earth and burned up in the atmosphere, forcing a group of astronauts to spend an extra month on the ISS. In May, another Russian spacecraft, a Proton-M rocket carrying a Mexican satellite, malfunctioned and crashed in Siberia soon after its launch.